Our new series of tank cleaning nozzles offer a comprehensive spectrum for the cleaning of containers with different sizes and degrees of soiling. The HydroWhirlTM Orbitor is a versatile high performance tank cleaner, designed to meet the exacting requirements of the food, beverage and chemicals industry. The Orbitor is highly efficient, giving powerful cleaning for less water consumption. It is hygienic and self cleaning, meaning that it is suitable for use in sterile environments and the robust design means maintenance costs are low. The rotating HWS tank cleaning nozzles (with ATEX certificate) and HWP series give 360° cleaning of small and medium size tanks. Both models can be configured to give 180° cleaning if required. Our stationary tank cleaning nozzles range (TW, Clump and LEM) offer versatile tank cleaning for small to medium sized vessels. A number of different nozzles types can be mounted on the Clump and LEM manifolds giving a greater degree flexibility meaning cleaning can be tailored to specific applications. BETE’s 60 years of nozzle manufacturing experience spans all industries. 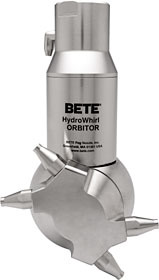 Since John BETE’s invention of the spiral nozzle in 1950 BETE has continued to innovate. Our nozzles can be found in the freezing cold of the arctic, in the heat of the deep desert, in the depths of the ocean and even in space. This wealth of experience means we are able to advise on all conceivable spraying processes whether they are old, tried and tested installations that need optimizing, or completely new applications still in the design phase. 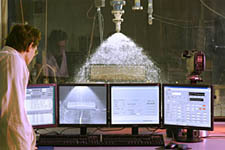 Complementing our manufacturing excellence is a complete worldwide customer service, expert engineering advice, spray lab and computational fluid design services, market-driven prices and a fast efficient order processing. This makes BETE a uniquely reactive and customer focused organization meaning that whatever your spray technology problem, simple or complex, big or small, new process or standard application, you can rely on BETE to give the correct advice on the best product in a timely fashion. The BETE team looks forward to your request for quote.